Eggs and smoked haddock are perfect partners. Our smoked haddock fillet is available dyed (natural yellow) and undyed from the Fish Service Counter. Serve with Waitrose Tenderleaf Salad or Solo Baby Spinach. Pour the milk into a deep-sided frying pan, then add 300ml cold water and the bouquet garni. Season with the pepper. Place the haddock fillet in the pan, cutting it in half if necessary to fit. Add a little extra water so that the fish is just covered. Bring the liquid to a simmer, cover and simmer gently for 3-4 minutes, depending on the thickness of the fillets, until the flesh is opaque and tender. 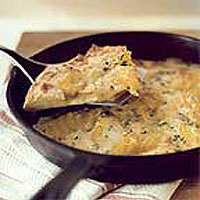 Using a slotted spoon, carefully remove the cooked fish from the pan and transfer to a plate. Leave to cool for 3-4 minutes, then remove the skin and, using a fork, break the flesh into large flakes. Preheat the grill to high. Beat the eggs with a little seasoning. Melt the butter in a small frying pan, about 20cm wide, with an ovenproof handle, until the butter begins to foam. Pour the eggs into the pan and cook over a medium heat for 10 seconds until the eggs begin to set around the outside. Then, using the back of a fork, pull the set egg from the outside of the pan into the centre, allowing the uncooked egg to run to the outside. When the omelette is almost set, but still moist, spoon over the smoked haddock flakes and scatter with the parsley and grated cheese. Place under the hot grill for 2-3 minutes, until the cheese is melted and just golden brown. Transfer the omelette onto warm plates and serve immediately. For a really indulgent finish to this dish, spoon a couple of tablespoons of double cream over the fish and then top with the cheese before placing under the grill. For an alternative recipe that is perfect for a light brunch, poach the same quantity of haddock as above, divide into two and serve topped with a poached egg and a scattering of chopped parsley.